Take two paper towels, wet them with water, and then squeeze excess water off—ensuring the paper towel remains very damp. Score the head of the cabbage to remove the hard outer part with a sharp knife. Cover the head of cabbage with these paper towels and put in microwave for 6 minutes. This is a much easier and quicker method than boiling cabbage in a pot of water (you’re welcome)! Meanwhile, prepare the filling. Add 1 tablespoon olive oil to a pot over medium heat. Add chopped onion and garlic and cook for 5 minutes until onions are translucent and garlic is fragrant. 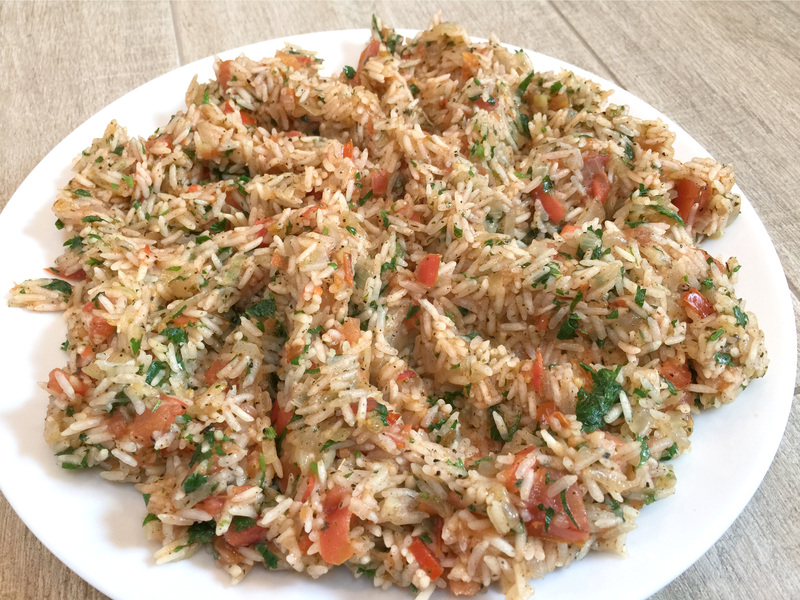 Add the rice into the garlic & onion mixture and continue to stir frequently for 3 minutes. Turn heat to low. Add salt, pepper, cinnamon, and next 5 ingredients (up to cardamom) to pot and mix until spices are combined throughout mixture. Add tomato to mixture, and mix for one minute before turning off heat. Add the parsley & dried mint to the mixture, and transfer to a plate. Remove the cabbage from the microwave carefully, and take the first 7-10 leaves off. You want the leaves soft enough to be able to roll, but not too soft because it still has to cook. 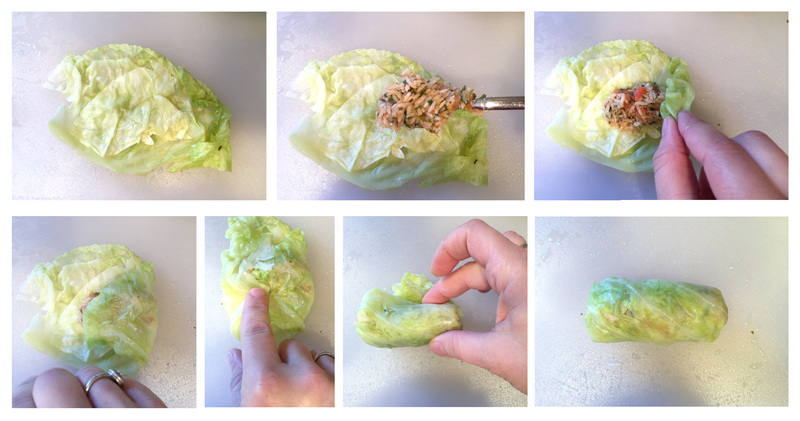 Wrap the remaining cabbage in the paper towel minus the 7-10 leaves, and continue to cook in microwave for 2-3 minutes. Remove the cooked cabbage from the microwave & place on a plate next to the plate of the filling. Take each cabbage leaf off carefully. Take the larger outer leaves and cut them in half along the hard stem (remove stem while doing so). 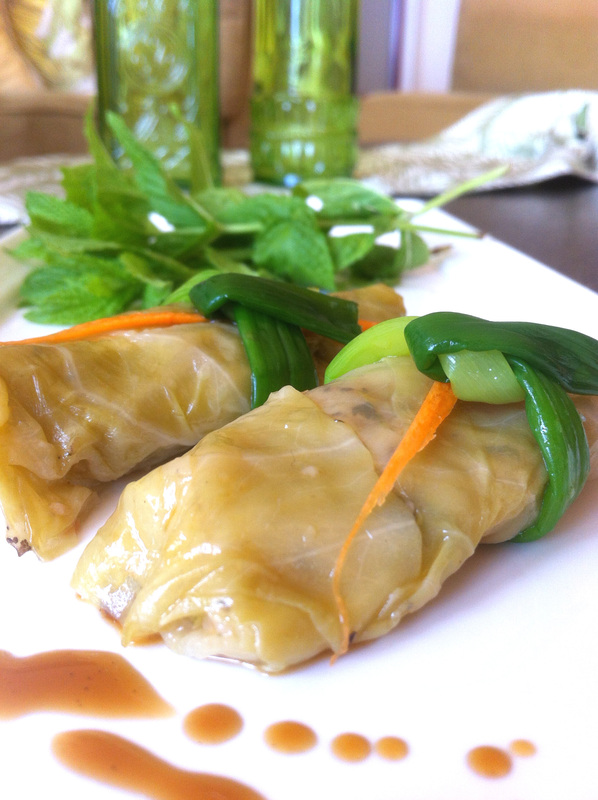 Put approximately 1 tablespoon of filling within each cabbage leaf, towards the bottom third of the leaf. Roll the leaf up, while pulling the side of the leaves inwards until you have a roll. Think of rolling a burrito! Note that you may have a cabbage leaves left over that may not be filled. Save these, as they are an integral part of the cooking process! Line up any leftover leaves along the bottom of a large pot. If you do not have any cabbage left over, you may add the thinly sliced potato along the bottom of the pan to provide a barrier between the bottom of the pot & the stuffed cabbages. 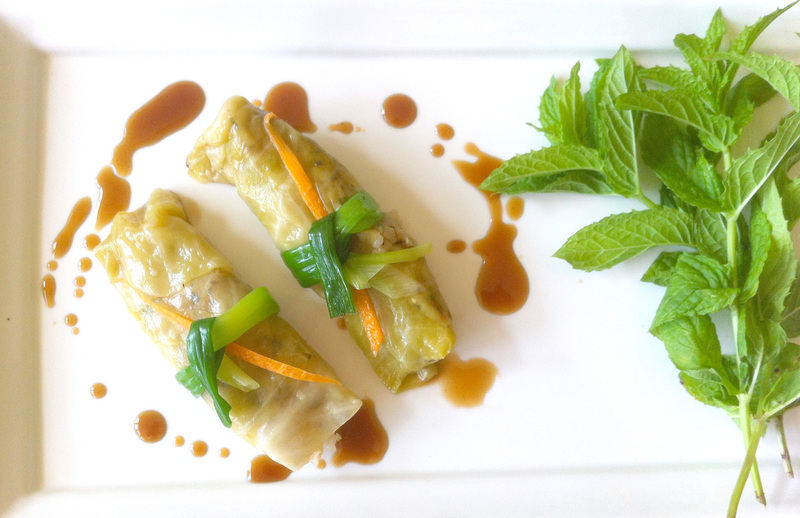 After placing either the cabbage leaves or the potato along the bottom, begin to arrange the stuffed cabbage in circular layers. To prepare simmer sauce, add 5 cups hot water, 1 teaspoon salt, 2 large lemons, 1 tablespoon pomegranate molasses, and 1.5 tablespoons extra virgin olive oil. Set aside. Add approximately 3.5 cups of the simmer sauce to pot, or enough to where it covers all of the stuffed cabbage. Weigh the stuffed cabbage down with a heavy trivet. If you do not have this, you may weigh it down with a plate, and fill a bowl with water and place on top of the plate to add weight. Turn the cabbage on high heat until the simmer sauce boils. Once boiling, lower to medium-low heat and keep covered. Peek on stuffed cabbage after 30 minutes to see whether more simmer sauce needs to be added. If the simmer sauce has evaporated, replace with some of remaining simmer sauce and assure all the cabbage leaves are covered. Continue cooking for a final 15 minutes. Lift the trivet or the plate & bowl and remove one cabbage leaf. 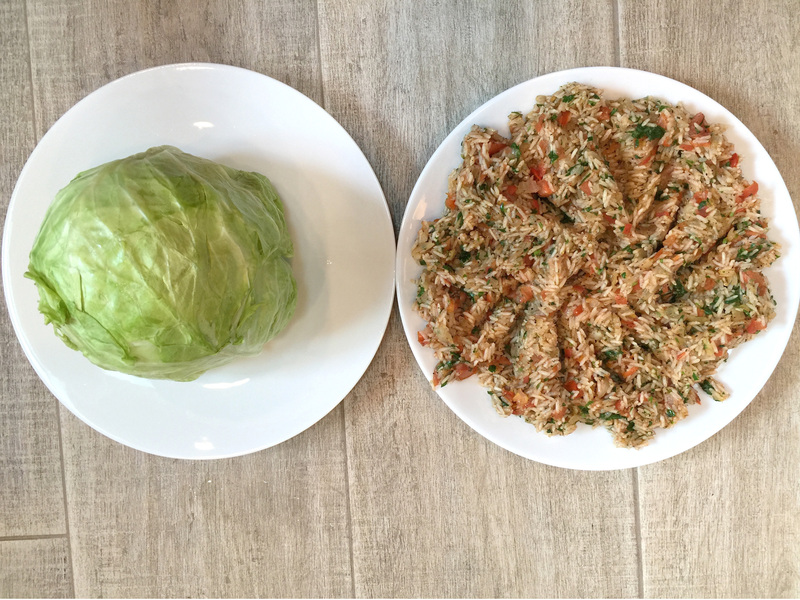 Cut the cabbage in half and taste it to ensure the rice has been cooked through. Take note that the rice is well-cooked, but the cabbage is not overcooked. A total cook time of 45 minutes is generally the magic number. Very carefully pour simmer sauce into a medium sized bowl while holding cabbage leaves down with trivet or plate. Serve cabbage leaves at room temperature along with simmer sauce as pictured. Yalanjy or Cabbage leaves will last for 7-10 days in refrigerator!